Below are some of the most common issues homeowners may experience in regards to water heaters and hot water. To make it easier for you, there are sections for both Electric and Gas water heaters. Troubleshooting a problem is essentially a process of elimination so work your way down the list until you find the issue that most resembles what you are experiencing. As always, if you are not completely comfortable with making the repairs yourself, please call a professional plumber. If you believe you have a leak near the top of your electric water heater, it could be one of a few things. The cold inlet or hot outlet pipes may be loose, the T&P valve may have failed, or inlet valve may be leaking. All are easily fixed. For more information, see Water Heater Leaking from the Top. In some cases, the actual tank is leaking and the only fix is to replace the water heater. For more information, see Water Heater Leaking from the Bottom. Other possible reasons for not having enough hot water include a faulty thermostat, faulty element, loose wiring, or simply a water heater tank that’s too small for your needs. See “What size water heater do I need” for more info. Again, this is likely related to the thermostat(s) where the temperature is set too high. Simply gain access to the thermostat and adjust as needed. This may also be needed when transitioning from cold to warm seasons. For our recommended temperature setting, click here. If you cannot lower the water temperature low enough, you may need to replace your thermostat or there may be some type of wiring issue (recommended to call a pro if the later). This is one of the downsides with electric water heaters. On average, recovery time (time it takes to reheat entire supply of water) on an electric model is double that of a comparable gas model. The amount of time it takes to heat up water can vary quite a bit between different models. Newer is usually better. That said, if it’s taking longer than usual for the hot water to recover, there may be an issue with the heating elements (including sediment build-up on them) or thermostat and those parts may need to be replaced. If your household tends to use more hot water now than a few years ago, you may want to consider investing in a new model with a larger capacity tank, a tankless model, or installing a point-of-use water heater that’s close to the water source you use the most (ie: the shower). But we recommend to do some research on the tankless vs tank water heater comparison. Most often, those reporting to have low hot water pressure have an older home with 1/2-inch diameter galvanized piping that enters and leaves the water heater. Since water pressure is automatically limited, the only solution is to install modern 3/4-inch piping which allows more water to flow through. Sediment, calcium-deposits, and rust inside your plumbing or sink aerators may also contribute to low hot water pressure. If you hear popping, hissing, banging, knocking, or other strange noises from your water heater, it’s most commonly due to scale build-up on your heating elements or too much sediment build-up in the bottom of the tank. Other causes of noises include a leak somewhere, too much pressure inside the tank, or noisy pipes because of normal expanding/contracting. When your water heater is making noise, it’s often harmless but should always be looked into for piece of mind. Rusty hot water is often a sign of corrosion of the anode rod or even tank itself. If left untreated, your water heater will most likely need replacing once the corrosion gets serious enough for the tank to develop a leak. Replacing the anode rod is easy to do and can add years to your water heater. If the water is not rusty but dirty or discolored, it may be because of scale build-up on the heating elements or sediment that’s making its way into the hot water outlet. Most likely, smelly or stinky hot water is due to bacteria in the tank. Homes which use well water as their water source are more susceptible to their water giving off a foul odor. Periodic flushing of the water heater may temporarily help but to actually fix the sulfur or rotten egg smell from your hot water, you’ll likely need to replace the anode rod. Better yet, consider a powered anode rod which will get rid of the smell and last the longest. A quick fix may be to increase the thermometer temperature to about 140 degrees to kill off any remaining bacteria. Same as with an electric water heater, you should first check the cold water inlet and hot water outlet pipes and connections to make sure they are not loose. A faulty or loose temperature and pressure relief valve or inlet valve may also be the cause of leak. See Water Heater Leaking from the Top for more information. When you see water that appears to be leaking from the bottom of a gas water heater, it could be because of condensation (try turning up the thermostat), a leaking or loose drain valve, or the T&P valve draining some water through the overflow pipe due to tank overpressurization. If the leak is from the water heater tank due to corrosion, replacement of the water heater is necessary. See Water Heater Leaking from the Bottom for additional information. The very first thing to check is if you have gas flow and that your pilot light is on. If yes, the issue may be with the thermocouple which is not correctly sensing that the pilot light is on and in turn does not ignite the gas. The thermocouple may need to be replaced (or simply cleaned). If you have a newer style water heater with electronic ignition, check your breaker box to see if the circuit breaker is tripped. See here for more info. Some reasons for not having enough hot water or running out of hot water too soon include not having the thermostat set at a high enough temperature (especially in the winter months), a faulty thermostat, or a broken or damaged dip tube which allows the incoming cold water to mix with the hot water at the top. Sometimes not enough hot water is simply because you have a water heater tank that’s too small for your needs. Even though you may have a 40 gallon tank, only about 28-30 gallons of it may be usable hot water at a time. Upgrading to a larger water heater or a tankless model may be in your future. Most likely, you have the thermostat set too high. This is most common when transitioning to the warmer Spring and Summer months and forgetting to set back the temperature after raising it to account for the colder Winter temps. Less likely is a faulty thermostat that needs replacement. If it feels like your gas water heater recovers too slowly, the thermostat may be set too low, the burner orifice may be too dirty or clogged and requires cleaning, the gas pressure may be too low, or the vent flue may be too dirty and also require cleaning. For many, it’s simply a matter of having too small of a water heater tank for their family’s needs and it’s never given a chance to fully recover. If you have an older home, there’s a good chance you have the smaller 1/2-inch diameter galvanized piping throughout your home. This greatly reduces the amount of hot water than can flow through your home’s plumbing. Unfortunately, the only way to get noticeably higher hot water pressure is to switch out to the newer 3/4-inch piping that’s used in today’s homes. Definitely not a small task. You may be able to slightly increase water pressure by cleaning out sink aerators or shower heads which tend to get clogged over time. Also, make sure your water inlet valve is fully open and not partially closed. When you know exactly how to light a pilot light on a water heater yet it won’t light, there are a few possibilities as to why. Either the pilot light orifice or tube is clogged or needs replacement, the thermocouple is loose or faulty, there is air in the gas line, or the gas valve is defective. Just as annoying as a pilot light that won’t light, is a pilot light that frequently goes out. Most often, thermocouple replacement is necessary. Other possibilities include a bad gas valve or partially clogged vent which can cause downdrafts that blow out the pilot light. A burner that at times goes out or produces an unusual, higher or lower than usual flame or even a whistling sound, is most often due to dirty or clogged burner orifices. As with the pilot light, a faulty thermocouple or dirty vent may also be the cause of the problem. Same as an electric water heater, hissing, popping, knocking, or banging noises can sometimes come up. On gas models, this is typically due to sediment build up in bottom of the tank, expanding/contracting piping which rubs against wood framing within the walls, or dirty/clogged parts which gas flows through. Once again, corrosion of the anode rod or the inside of the water tank itself is usually to blame. While replacing the anode rod isn’t complicated or expensive, the bigger problem lies if the tank shows signs of corrosion. It’s then only a matter of time before a leak develops and a new water heater will be needed. Likely due to bacteria build up inside the tank. Simply turning up the thermostat to about 140 degrees should kill off the bacteria but a full clean-out of the tank with chlorine bleach may be necessary. If the smell comes back, the anode rod is likely at its end of life and will need replacing. Hello, I have a Jacuzzi tub in an upstairs bathroom far from the hot water heater. I am going to run 3/4″ PEX tubing from a tee in the hot water line in the basement up to an auxilliary hot water heater in the bathroom where the Jacuzzi is. I only have enough room for a 4 gallon heater with a 1/2″ inlet and outlet. Will I have enough volume and/or pressure to fill the tub? It previously had 3/4″ copper up to the bathroom and then 1/2″ going to tub. The second heater will be inline with the main water heater, so do you think the 4 gallon tank will help to fill the tub with hot water? The main by itself does not. Thank you for any advise you can give me. 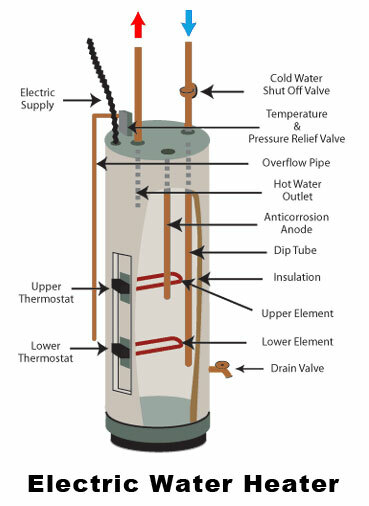 What size is the main water heater? Have you considered adding a second full size water heater in the basement? Anytime with an oversized tub, you will likely have issues with volume/pressure from a small point of use water heater. Have you also tried increasing the temp on the main water heater (unless you have young kids)? I have a gas water heater, the gas supply line is so hot that it is melting the protective foam cover. Any suggestions as to what it might be? Great article! Homeowners can empower themselves to troubleshoot before calling their local plumber. We repair hot water heaters quite often in our area and the majority of the time it is due to a lack of maintenance. The best thing a homeowner can do to ensure high performance and long lasting heating from their tank is to have it flushed annually. This will prevent sediment build up, odor, bad tasting water, ect. It greatly improves the quality of your water heater and can prevent many of the issues stated in this article. Which was a great article btw, it outlines what homeowners can due to troubleshoot before calling their local plumber. With the gas off, are you seeing a spark when you press the igniter? If so, have you tried cleaning the pilot line? A clogged line or dirt/deposits around the burner are often the culprit. If no spark, first check your wire connection but a new igniter may be needed. I was gone for a month so no water was being used. Now that I’m back, I have about 5 minutes of hot water before it goes cold. Anyone know why that could be? Hi I have the electronic automatic water heater. When I plug into Electricity connection,the total power has shutdown.Tried with another plug port. But I am getting the same problem. Can you tell what I have to do ? My gas water heater is making a rushing noise several times a day. We have added a larger over flow tank and replaced the pressure valves. This stopped the rushing noise for about 4 months but now is back. This is a new house built 2 years ago. Any suggestions? hi my heater has been making clanking sounds while is on and its also leaking black water that smells like something has burned. my landlord has had multiple plumbers come in to “fix” it but its getting worse. any suggestions on what to do???????? I have a 40 gallon gas unit that does not get hot enough. No matter where I turn the thermostat setting, it only gets lukewarm water to come out. The pilot light is lit and I’ve see the burner come on (once) but the water never gets hot before the burner cuts off again. It could be a few things. See this post. My State Select 50 gal. gas water heater will not maintain the temperature. When we don’t use it for a long period the water is just a little warm. If we run the water for a while it kicks in and heats up. I have replaced both heating elements, and both thermostats. I have the thermostats both set on 150*. I am only getting luke warm water at the faucets, though if I discharge water out of the top relief valve, steaming, very hot water is present. I’m pretty much in the same situation I was before the replacements of said parts. Can anyone help shed some light on my problem? I have a 6-7 yr old Whirlpool 50g gas water heater. Recently the pressure relief valve has been releasing pressure on a regular bases. I have lowered the temperature setting and it still does it. I have hard water and know there is a lot of sediment build up in the bottom of tank. Could this be the reason or is it more along the lines of the valve itself? Or possibly the temperature probe? My hot water heater is side hub and has water coming out of both while hooked up so I have shut off the power and water to it, now I’m trying to find out why it might be doing this and what I can do to fix it, can anyone give me a clue on what might be the problem. I think it might be settlement but I’m not 100% sure so I’m trying to check all avenues. I have a propane gas water heater 50 gallon, the water is cold, we tried to relight the pilot but it failed, we tried three times, is it easy to remove the gas valve and install new one or do we need a plumber to repair that gas valve or may be the gas line to the burner, everything is sealed or is better to replace the water heater, it is around 8-9 years old, a Kenmore model. Replacing a gas control valve is definitely doable if you take it slow. The problem is that it’s a fairly expensive part and for a 9 year old water heater, a new water heater might be worth considering. If you’ve ruled out the thermocouple being the issue, I’d recommend getting a free quote in your area on a gas control valve replacement just to see where you stand. Too hot, replaced everything and still too hot i turned both down as low as it will go, not sure what it can be. You already replaced the thermostat and the water is still too hot at the lowest setting? Keep in mind that water heaters with two heating elements have two thermostats. It’s possible there’s a short in a heating element as well which keeps it on all the time. My gas water heater is making a rushing noise, leaking water from the back, bottom side,and also one of the pipes feeding into the tank gets hot when I turn the water back on. It’s been off all day, along with the pilot and the hot water heater itself. I had a new water heater installed. The T&P and drain valves feel very, very hot. The top of the discharge pipe near the T&P valve is also very hot. Is that normal? You likely have a closed loop system with no expansion tank installed. In that case, the valve is doing its job and probably releasing a bit of excess pressure in the tank. I’d recommend putting in an expansion tank. I have a electric hot water heater upstairs and gas downstairs. Both went out at the same time. I have checked the breakers. The gas is also leaking somewhere on the top. I see water running down, but do not see from where it is coming. Any ideas? If gas is leaking, the water heaters not working should be the least of your worries. If you smell a rotten egg smell, it’s possible it’s only a chemical reaction in the water but to be sure, I’d call a plumber asap! I have a gas water heater that is 4 years old. I typically never have any issues except for this morning. After taking my usual 15 minute shower I went to get dressed and heard what seemed to be air escaping from the water heater. I turned the water heater off for a minute or so then turned it back on. The noise has stopped and I’m keeping an eye on it. This is a 50 gallon heater. Any thoughts? There might be air escaping through the TPR (temperature pressure relief) valve if the valve is faulty but you shouldn’t really have an issue with excess tank pressure after a 15 minute shower. Try turning down the water heater thermostat a bit the night before your shower and see if that fixes the issue. The noise could also be due to when cold water which enters the tank to refill it makes contact with hot parts inside the tank and makes more of a hissing noise. Condensation on the outside of the tank could also cause the noise. Old water heater working but was leaking, replaced with new (both electric, same size). All working fine. Five days later, no hot water. Ideas? Check to make sure your breaker didn’t trip. If so, simply reset. If it happens again there’s probably a wiring issue. While rare for a new water heater, it’s possible a heating element failed. Just like with other appliances, there is occasionally a manufacturer’s defect on a part. Contact whoever installed it or contact the manufacturer if it was a DIY install. Our brand new gas water heater makes a bell like humming noise. The tank itself is making the noise. This usually happens in the morning when the kitchen faucet is turned on. For years I have had a problem with my electric water tank. Every time I run a bath (or fill the sink etc) the hot water runs for a few minutes and then slows to a trickle and stops. I runs long enough to fill 2 to inches in the bath and then stops. I turn the tap off then leave it for about 5/10 minutes and then I run the water again, and again it runs for a few more minutes and slows to a trickles so I repeat until I get enough water fro a decent bath. I’ve put up with this for about 15 years now (I live on the 9 floor and once many, many years ago I flooded my neighbours downstairs so this problem has been my insurance against repeating that!) I’ve meant to sort it for years but never get round to it, any ideas what it might be? A faulty ballcock arrangement, a blocked or dodgy gate valve, low pressure (I’m pretty sure its not the pressure as the cold water runs good)? Interesting. This does it on all hot water outlets? What happens if you let the hot water flow stop for the tub and then open a hot water faucet in a different part of the apartment? I would lean towards there being some kind of check valve issue at the top of the water heater. Alternatively, the wrong type of washer could be installed at the faucet. If the wrong material is used, the hot water could cause the washer/gasket to expand and stop water flow. Also, make sure any hot water shut off valves are fully open. The inside could also be affected by heat and shut off water flow if they’re not fully open.